The most notable aspect of coverage of the vice-presidential candidates in the 2012 campaign is that this time, Joe Biden has received about as much attention as his opponent. In 2008, John McCain’s surprise selection of largely unknown Alaska Governor Sarah Palin as his running mate, and her ability to energize the party’s conservative base, triggered a torrent of coverage as the press scrambled to construct a Palin portrait. In the late stages of the 2008 race, Palin was a significant figure in 28% of the campaign stories, almost half as many as McCain (62%) and three times more than Biden (9%). In this campaign, Paul Ryan, the Wisconsin Congressman, has received more coverage than Biden, but modestly so. 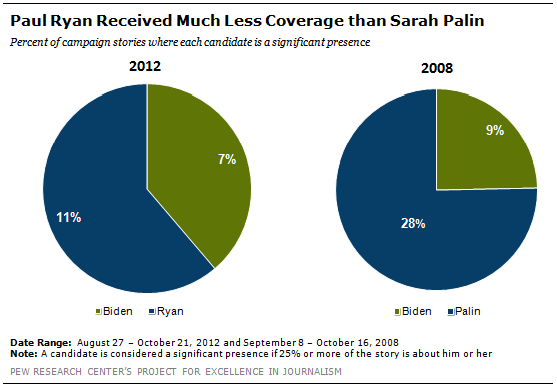 Ryan has been a significant figure in 11% of the stories compared with 7% for Biden. Romney’s choice of Ryan, a leading force behind Republican budget thinking, was viewed by analysts as a selection that would also help fire up the conservative base. But at least in terms of the volume of coverage, he has not proven to be another Sarah Palin. When it comes to the tone of the media narrative, the incumbent vice president has fared significantly better than his rival. From August 27-October 21, Biden’s coverage was equally balanced between positive and negative while Ryan’s negative coverage outstripped positive by 14 points. While the volume of coverage for the vice-presidential hopefuls was a fraction of that for the presidential candidates, both Biden and Ryan have received somewhat more favorable coverage than the men at the top of the ticket. Negative stories about Obama exceeded positive ones by 11 points while that gap expanded to 23 points for Romney. For Biden, that was not the case in 2008 when 25% of the stories about him were positive and 32% were negative compared with 36% that were positive and 29% negative for Obama. Palin’s coverage, while more negative overall (28% positive, 39% negative), was far better than McCain’s (14% positive, 57% negative). As was the case in the narratives about Romney and Obama, Biden enjoyed an advantage over Ryan in the tone of the strategic horse-race coverage. In that frame, 19% of the stories about Biden were positive and 14% were negative. For Ryan, it was 17% positive and 27% negative. The one week when the candidates found themselves squarely in the media spotlight was when they met in Danville Kentucky for an October 11 debate that was widely perceived to essentially be a draw. But in the media narrative, it was Biden who appeared to get the bounce. That week (October 8-14), 19% of the stories about him were positive, 17% were negative and 63% were neutral. Ryan faced considerably rougher treatment-11% of the stories about him were positive compared with 32% negative.